Scallops How to clean – Clutch the scallop (left-handed people reverse the process) with the left hand and use your scallop knife to pry open the scallop towards the back right side. The white side is the bottom of the scallop. 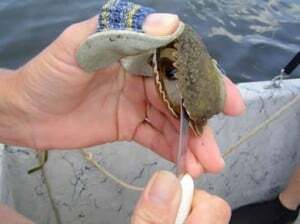 Once you’ve opened the top shell, take your knife and scrape into the top part of the shell releasing the scallop muscle from the top shell. Run your knife along the top outer shell to release the membrane from the shell. Toss the top shell. 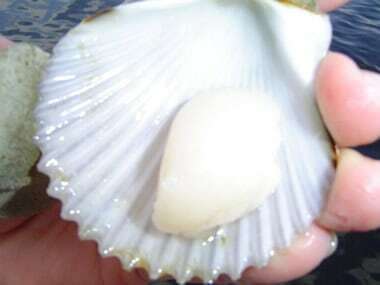 The photo shows the remaining membrane around the scallop after the top shell has been removed. 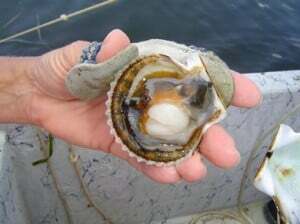 The membrane is like a coat around the scallop. You will take your knife and circle around the outside of the coat and then pull the top of the coat over the scallop like you see in this picture. Throw out the membrane. Scrape the bottom muscle from the shell and you now have your “treasure”, enjoy. 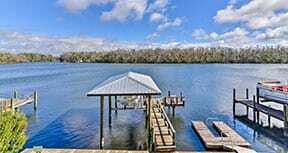 Like it or not, it’s a fact—the earlier in the season you go scalloping, the smaller the scallops will be. If you wait until later in the season they will be harder to find, but they will definitely be larger—and as many a seasoned veteran will tell you, easier to clean—but even the smaller ones can be cleaned fairly easy with patience, and a comfortable lawn chair in the shade.